Clear polyurethane welded sleeves and clear polyurethane welded tubing from Custom Advanced offer many advantages over traditional socks, boots and sleeves. Our polyurethane welded sleeves can be cut to exact length, allows for product viewing and in most applications it offers superior abrasion and chemical resistance. We have tubing compounds to meet your individual application specifications. Let us know if you need food grade, anti-static, high abrasion, etc. and we’ll supply the tubing extruded from the pellet formulation that is best suited for your requirements. 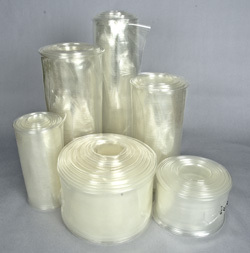 Many of our customers have started using clear polyurethane tubing in place of the corrugated style boots. The smooth bore alleviates product entrapment issues associated with the corrugations. In addition to the extruded sizes, non-standard diameters or tapered boots can be fabricated. They are built using the PerfectSplice. The splice is virtually invisible and no loss of material strength occurs in the process. The boots / tubing can be made in 30 or 60 mil wall thickness. The spliced boots are available with FDA food contact clearance and anti-stat as well. Elastic shock cords and or rings can be added to meet specific application demands. Complies with FDA regulations for direct food contact per CFR sections 175.105 and 177.2600. Specification sheets are also available upon request.